Letter from A. W. Macfarlane to F. R. Shelton dated January 21, 1885. Macfarlane was the secretary for the Florida Land and Colonization Company (FLCC) from 1884 until its dissolution in 1892. Presumably, he worked in the company's main office, located at 13 Austin Friars in the business district of London, United Kingdom. In this letter, Macfarlane informs Shelton, a Philadelphia-based lawyer and banker at Manayunk Bank, that he had been elected to the board of directors. Macfarlane reminded Shelton that the FLCC had some $75,000 in land notes housed at the Manayunk Bank and he expressed hope to Shelton that "with your large banking connections, you may be able to negotiate so as to meet the present requirements of the Company." Shelton's addition to the board of directors was a move prompted by Henry Shelton Sanford and the board of director's acquiescence on the matter was done in part in an effort to placate Sanford. Original letter from A. W. Macfarlane to F. R. Shelton, January 21, 1885: box 54, folder 1, subfolder 54.1.8, Henry Shelton Sanford Papers, General Henry S. Sanford Memorial Library, Sanford Museum, Sanford, Florida. Digital reproduction of original letter from A. W. Macfarlane to F. R. Shelton, January 21, 1885. Box 54, folder 1, subfolder 1.8, Henry Shelton Sanford Papers, Henry Shelton Sanford Papers, General Henry S. Sanford Memorial Library, Sanford Museum, Sanford, Florida. "Letter from A. W. Macfarlane to Henry Shelton Sanford (January 20, 1885)." RICHES of Central Florida. https://richesmi.cah.ucf.edu/omeka2/items/show/3399. "Letter from A. W. Macfarlane to Henry Shelton Sanford (February 3, 1885)." RICHES of Central Florida. https://richesmi.cah.ucf.edu/omeka2/items/show/3402. Originally created by A. W. Macfarlane. Fry, Joseph A. Diplomacy and Business in Nineteenth-Century America. Reno, NV: University of Nevada Press, 1982. 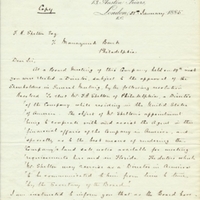 Austin Friars; bank; banker; board of directors; finance; FLCC; Florida Land and Colonization Company; investment; land note; Macfarlane, A. W.; Manayunk Bank; Sanford; Sanford, Henry Shelton; Shelton, F. R.
Macfarlane, A. W. . “Letter from A. W. Macfarlane to F. R. Shelton (January 21, 1885).” RICHES of Central Florida accessed April 18, 2019, https://richesmi.cah.ucf.edu/omeka/items/show/3400.